For most RTOs, compliance equals red tape, audits and the avoidance of penalties. All too often, it falls on the shoulders of a single compliance officer who cannot succeed alone – and time is running out. 75% of RTO’s fail to demonstrate compliance in key areas and have until 1st April 2019 to put things right1. 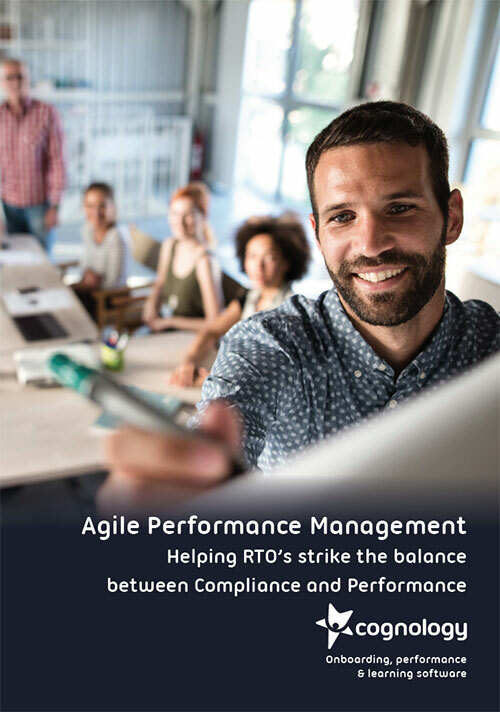 RTOs that use agile performance management to develop their commitment to compliance often find they are more successful as a result. 6 things employees need to know to perform well in their jobs. 7 essential questions to help your employees reflect on their performance. How to set SMART goals that align with your business objectives. 6 high impact alternatives to traditional training to comply with RTO national standards. The secret to finding and fixing compliance issues before they become a breach. Tick the right compliance boxes in your RTO. Time is running out. Download our whitepaper now.